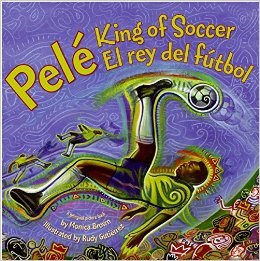 This week we are taking a look at Pele King of Soccer written by Monica Brown illustrated by Rudy Gutierrez. A wonderful biography about Pele, world cup soccer champion. This book is geared towards children and part of our Hispanic Heritage Month books. What is Pele King of Soccer about? Pele King of Soccer is about the amazing Brazilian soccer superstar Pele. He was a poor kid born in Brazil. Pele didn’t have an easy life. He struggled with poverty, not enough money to buy shoes or a real soccer ball. However, he was determined and hard working. That determination, talent, hard work and even a little bit of luck helped him to overcome the obstacles. Pele overcame obstacles such as being poor and not being able to all the advantages money can give you. This book is wonderfully written in both English and Spanish. The illustrations are vibrant and colorful. Definitely a great addition to the already engaging biography. Pele King of Soccer teaches about the life of the most famous soccer superstar, World Cup Champion Pele. Additionally, teaching how you can survive and even thrive without much. Pele couldn’t afford shoes to play soccer as a child nor could he afford a ball. He made due with what he had and still succeeded. That is a good message.